Fall recipe time! 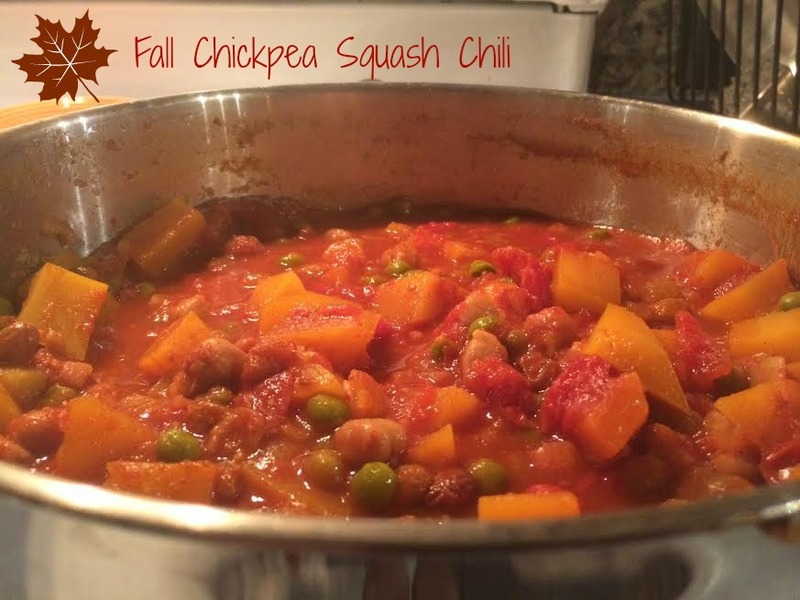 I would definitely consider this chili a fall recipe since it uses butternut squash (for some reason squash equates to fall and winter in my mind). I waited to post this until fall for this reason because I actually made it this summer (breaking all the rules!). We had leftover butternut squash from this mac & cheese recipe I made a few days earlier. I originally followed the “seasonality rules” with this two falls ago when I was living in Boston and wanted to make a fall dish (which was a surprise to myself since I wasn’t big on complicated recipes). Similar with baking, I was never super into cooking elaborate dishes, but for some reason I saw the squash at a farmer’s market and found this particular recipe for Chickpea Chili calling to me. It turns out that I really enjoyed cooking it and suddenly cooking became a lot less scary and a lot more interesting. The original recipe can be found from Cooking Light and requires a crock pot and around 9 hours of simmering, but it can definitely be made in a medium-large pot with 3-5 hours of simmering. It’s a great dish to make on a Sunday afternoon when you don’t have any plans and it fills the entire house up with a lovely aroma of spices. It also keeps well and tastes excellent heated up! And the great part is that you WILL have leftovers from this recipe! Heat a large skillet over medium-high heat. Add 1 tablespoon oil to pan (or cooking spray). Add onion; sauté 4 minutes, stirring occasionally. Add garlic; sauté 1 minute, stirring constantly. Stir in tomato paste and next 5 ingredients (through turmeric); sauté 30 seconds, stirring constantly. Add onion mixture to slow cooker. If you don’t have a slow cooker, you can use a large pot (which is what I used). Add broth and next 4 ingredients (through tomatoes); cover and cook on HIGH 8 hours. Or, if you are using a pot, 4-5 hours. Heat a large skillet over medium-high heat. Add remaining 1 tablespoon oil; swirl to coat. Add squash and sauté 5 minutes. 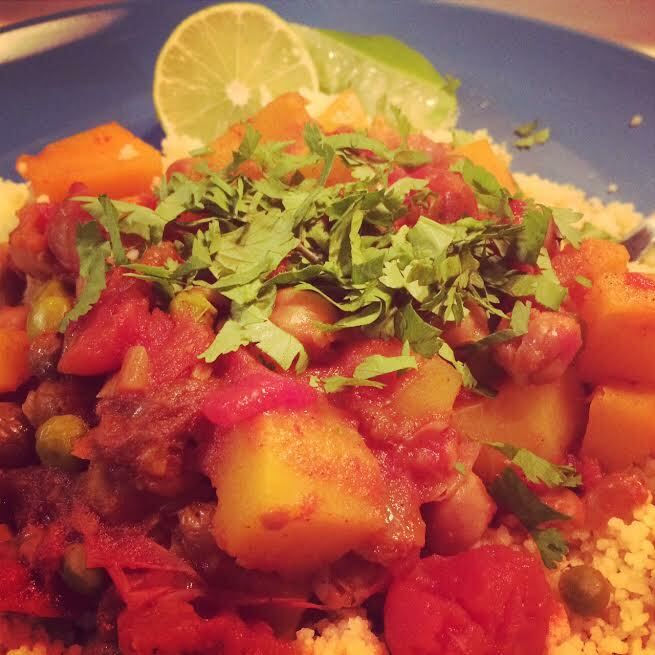 Add squash to slow cooker/pot. Cover and cook on HIGH 1 hour, or low-medium heat. Stir in peas. Sprinkle with cilantro. 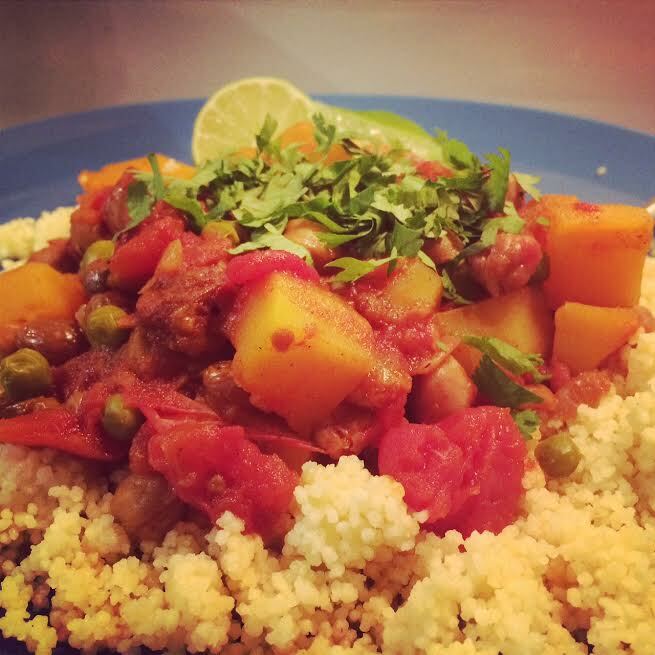 Serve over couscous with lime wedges!